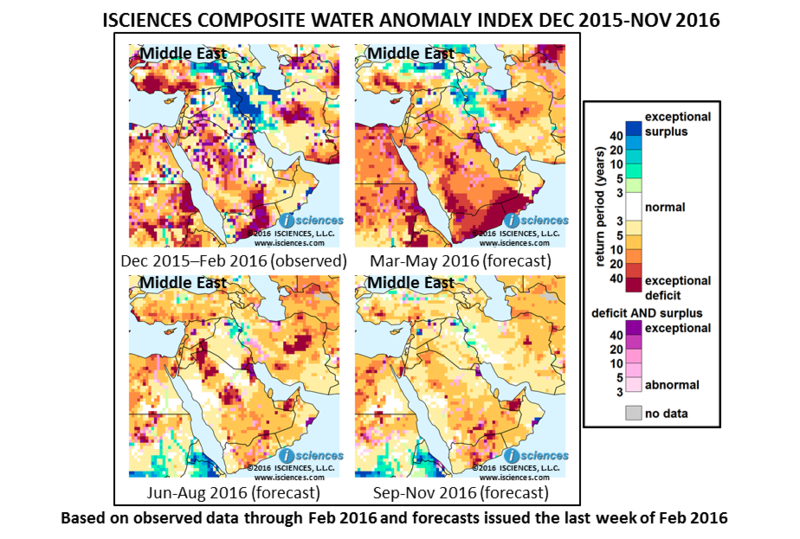 The 12-month composite map (below) shows exceptional water deficits forecast in southern Turkey and eastern Yemen. Surpluses are forecast along the Iraq-Iran border and a small region in northeast Turkey. Elsewhere the forecast indicates deficits of varying severity for the region, with both deficits and surpluses predicted in some areas. Watching groundwater levels shrink over the years, Turkish farmers in Western Anatolia worry about the future of independent farming. Where thirty years ago a well seven meters deep was sufficient, growers are now digging several hundred meters to find water. Rapid population growth has contributed to Turkey's water stress. Competition for the precious resource is also coming from Turkey's new tourism industry - golf courses - which require massive amounts of water. Though the eastern Mediterranean is known for its aridity, a recent NASA study found that the 1998-2012 drought in the Levant was the worst in 900 years. An altogether different kind of water hazard is threatening Iraq. In late February the US Embassy issued a fact sheet on Iraq's Mosul Dam, detailing a "serious and unprecedented risk of catastrophic failure without warning," along with recommendations for emergency alert and evacuation. The 3-month composites (below) for the same 12-month period show the evolving conditions in more detail, with the most widespread and severe deficits clearly evident March through May on the Arabian Peninsula. Severe to exceptional deficits are forecast to encompass Yemen and western Oman. In Turkey’s western and southern regions deficits are forecast to persist during this time, while surpluses may linger in the northeast. Surpluses along the Iraq-Iran border and in Iran along the Caspian Sea are forecast to diminish. From June through November deficits in the Middle East are forecast to diminish in severity, though not in extent, in most areas. One exception is United Arab Emirates, where moderate water deficits may become exceptional.